This may seem a little late, but eggnog is still in the stores, and sometimes cravings exceed their season (I’m still making pumpkin treats!). I made these delicious little treats for Christmas, and they were a huge hit. And this just shows how far behind I am with things still! My goal was to have this posted in time for Christmas, along with some other little candies I made, but obviously that didn’t happen… sorry! I’ll try to be more on top of the ball! Place the white chocolate in a medium glass or metal bowl; set aside. In a small saucepan, heat the cream and eggnog until barely boiling, stirring regularly. Add hot cream mixture immediately to the white chocolate and stir until melted and glossy. If chocolate doesn’t melt completely, heat over low heat in a double boiler or microwave for short increments in the microwave. Once melted, stir in the rum extract and nutmeg. Let cool to room temperature then place in refrigerator for a couple hours until solid enough to form truffles. Using a small cookie scoop or a teaspoon, scoop out balls of ganache and place on a cookie sheet lined with waxed or parchment paper. Using your hands, roll the ganache into smooth, uniform balls and return to cookie sheet. Refrigerate overnight, or until fully solid. In a double boiler over low heat, or in a microwave safe bowl, melt the melting chocolate until smooth and glossy. In small batches, remove truffles from the refrigerator and use a fork to dip the cold ganache into the melted chocolate. Place dipped truffles on another cookie sheet lined with waxed paper. Decorate or garnish if desired, while chocolate coating is still soft. Continue to pull batches of ganache from the refrigerator to dip in the melted chocolate until all are dipped and garnished. Let coating harden at room temperature, or place in refrigerate to expedite hardening. Serve truffles at room temp; store in airtight container in the refrigerator. Oh, I’m definitely keeping this one for the holidays!! How perfect!! Hubs would die for these, I’m sure. And he loves the homemade eggnog, too. My husband is a huge fan of white chocolate, these are definitely perfect for him. I can easily devour a whole lot of those goodies! I really began to enjoy eggnog the past holiday season – these look yummy! I LOOOOVE truffles! These are so adorable and seasonally flavored. Well done! 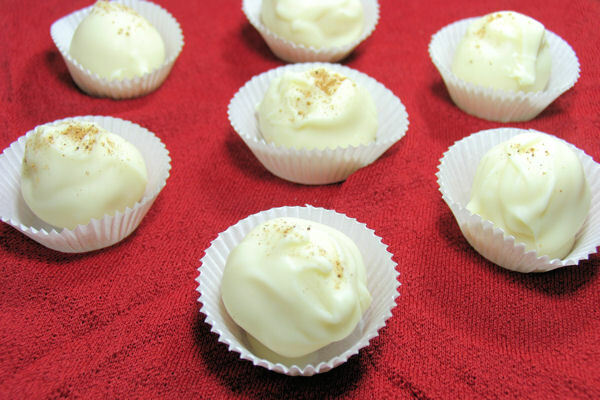 Eggnog truffles?! Absolutely yes! Doesn’t matter when and using up left over eggnog is a big plus. Yours are gorgeous…so professional! Thanks for stopping by and leaving a lovely comment on our blog! These truffles look dangerously good! 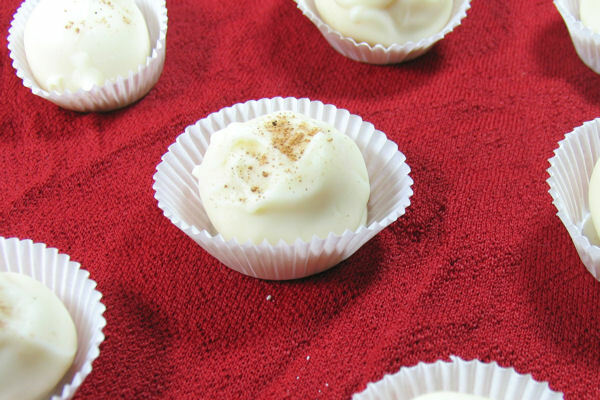 NEVER too late for eggnog truffles! I am not an eggnog fan either, but these look amazing!